Christensen Associates is an economic analysis and consulting firm that provides creative and timely solutions to business challenges. They give clients a competitive edge in today’s marketplace through the use of state-of-the-art analytical techniques and institutional knowledge, and their new office reflects their forward thinking approach to business. Located in the 800 University Bay Drive building (also designed by Potter Lawson), their new space occupies18,000 square feet. Due to the sensitive nature of their research, privacy and security were a top priority. Most of the 55 private offices and conference rooms were designed with specialized sound proofing. Though they take their work very seriously, the office has a playful and modern feel. This is evident immediately in the reception area which features a custom reception desk with wood, quartz and glass, and echoes the architecture of the adjacent conference room. Varying ceiling heights adds visual interest and serves as a means of way finding. 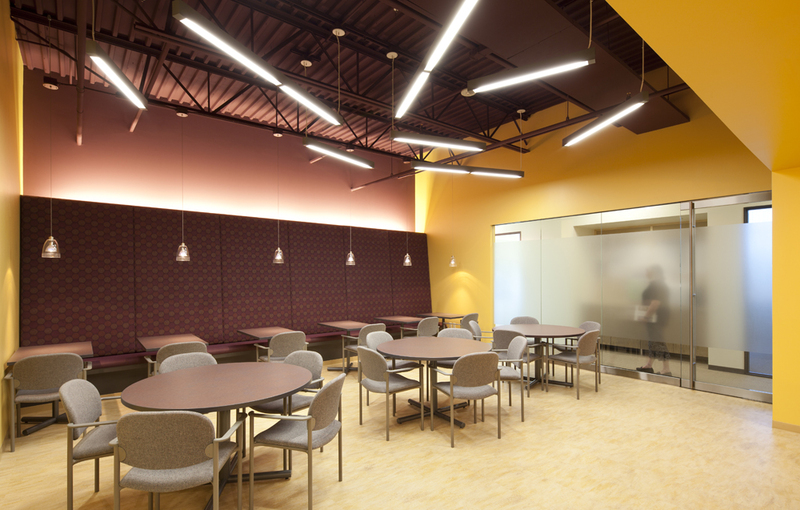 The creative use of color identifies support spaces and conference / multi-purpose areas. Vivid color is offset by a gallery quality, subdued carpet, with the balance of the color palette providing a backdrop for their extensive artwork collection. 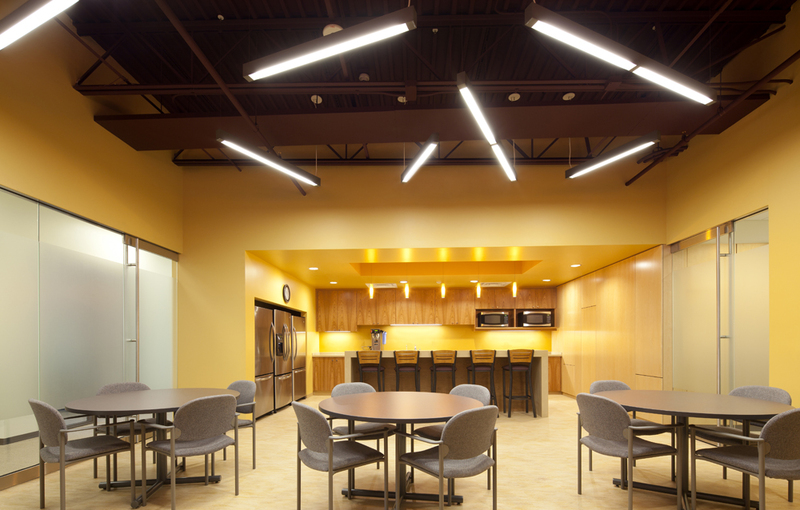 The break room serves as a hub of activity at the start of each day, and provides a visual “get away” from the typical office. Custom seating gives the space a café-like feel that is further accented by specialty lighting and a rich color palette. With a goal of being energy conscious and sustainable, the kitchen features energy star appliances, and a reverse osmosis water filtration system replaces bottled water. 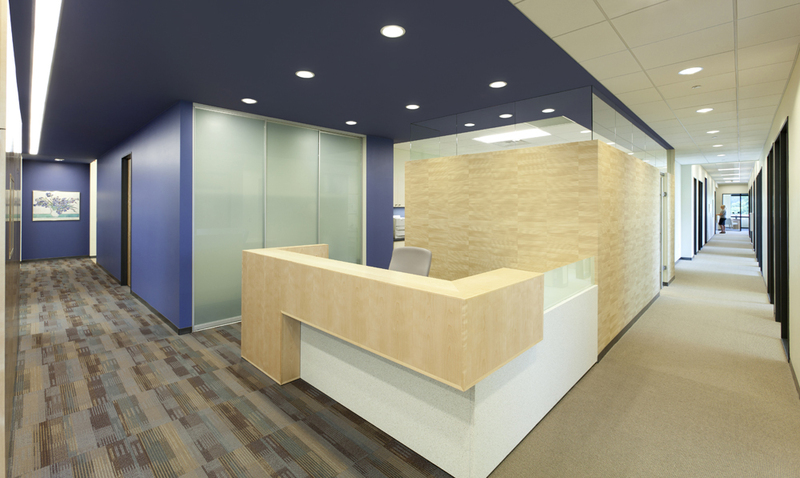 We also maximized the use of natural daylight with sidelights and transoms throughout the space, and many of the interior finishes had high recycled content.